The 2018 CEDIA Expo wrapped up this weekend in San Diego, leaving projector shoppers and home theater lovers some great new products to ponder and lust after. CEDIA is a trade-only event that restricts attendees to residential and commercial integrators, equipment manufacturers, and industry consultants and press - no consumer walk-throughs. But, no worries if you didn't get to attend. ProjectorCentral was on-site to pore over all the new goodies, so read on. The JVC announcement that the company is finally releasing native 4K projectors for the consumer market was among the most welcome at CEDIA. 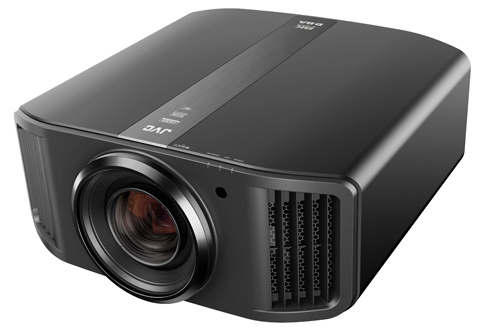 Though not the brightest blasters on the planet, JVC's consumer LCOS projectors are renown for their excellent contrast, and it's been a frustration among some hobbyists that they have till now stuck with 1080p pixel-shifters, which accept 4K signals but visually deliver something between 1080p and full 4K resolution. JVC officials said they were determined not to sacrifice contrast for the benefit of higher resolution in their D-ILA models and needed time to perfect the 0.69-inch 4K D-ILA imager found now in three new projectors (technically, six new models including both consumer and commercial designations). The entry-level model, designated the the DLA NX5 (consumer) and DLA-RS1000 (commercial) is priced at $6,000 and offers up 1,800 lumens of brightness, contrast rated at 40,000:1 native and 400,000:1 dynamic, a pair of 18 gigabit per second HDMI 2.0 inputs (with HDCP 2.2) and an all-glass, 17-element lens. The DLA NX7/DLA-RS2000, priced at $8,000, jumps to 1,900 lumens and an 80,000:1 claimed native contrast ratio, but critically adds JVC's auto-iris technology to deliver dynamic contrast up to 800,000:1. The NX-7 and the step-up NX-9 also feature a new color filter that provides wide color gamut beyond DCI-P3 that should come into play as BT2020-mastered content eventually becomes available. The new top-of-the-line is the DLA-NX9/DLA-RS3000. Priced at $18,000, it uses the same 4K D-ILA imagers as the other models but also employs JVC's e-shift pixel-shifting technology to put 8K resolution on the screen. The effect is enhanced by a super-fine, 100mm, 18-element lens. Light output is rated at 2,200 lumens, and thanks to the hand-picking of the imagers and the Intelligent Iris, contrast goes to 100,000:1 native and 1,000,000:1 dynamic. JVC demonstrated this projector with 8K video shot in Peru and Morocco, which was downscaled first to 4K (the highest resolution signal the projector will accept) before the NX9's e-shift function kicked it back up from 4K's 8.8 million pixels to just over 35 million pixels of information delivered to the screen. On a 160-inch diagonal Stewart StudioTek with 1.3 gain in a light-controlled theater, the image was both highly detailed and breathtaking in its color and contrast. Machu Picchu never looked so good, except maybe in person. All of the new JVCs are ISF-certified, and feature compatibility with HDR10 and HLG high dynamic range content. New for these models is something JVC calls Auto Tone Mapping. Instead of simply allowing the presence of the HDR flag in content to trigger a fixed HDR viewing mode, JVC looks for the standardized HDR metadata that describes both the peak brightness and average brightness of an individual program, which it then uses to apply adjustments to the playback settings. This should insure best results with individual HDR-encoded titles, which can vary widely in their mastering parameters. When this information isn't available, users can still manually adjust their HDR picture settings from the fixed default. The new models will be available in early November. In one last bit of news, JVC said it will retain one 1080p e-shift projector from its existing line-up, the popular and well-reviewed mid-tier model DLA-X790/RS540, for which it is dropping the price from $6,000 retail to $4,000. Sony also came to San Diego with three new native 4K models. 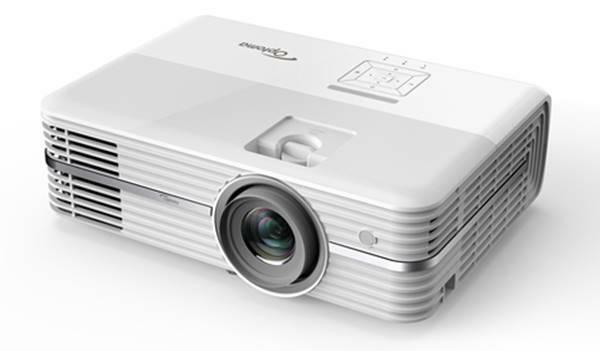 The VPL-VW295ES replaces the previous line's VPL-VW285ES, which broke new ground on its introduction in 2017 by being the least expensive native 4K projector (meaning no pixel-shifting) released to that date for the consumer market. The new model retains its predecessor's $5,000 retail price tag and 1,500 lumen output, but utilizes Sony's new generation 4K processor, and like the other new models, offers further improvements that include full 18 Gbps HDMI inputs, Motion Flow motion enhancement for full 4K signals, and a significant reduction of input lag for 4K gaming. As with prior 4K models, all the new projectors are also HDR10 and HLG compliant to take advantage of high dynamic range content. With the VW295 expected to go to market in October, the VW285 is being sold promotionally now for $4,000, Sony execs said. The VPL-VW695ES is priced at $10,000 and replaces the VPL-VW675ES as Sony's 1,800 lumen model. As the direct step-up from the VW295ES, it adds Sony's Advanced Iris dynamic aperture to enhance contrast ratio, which is rated at 350,000:1. (Sony publishes no contrast spec for the VW295ES.) 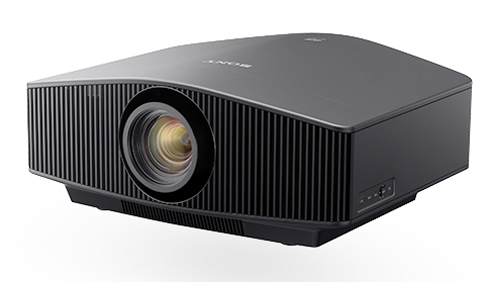 The pre-existing VPL-VW885ES, Sony's least-expensive laser-driven projector priced at $25,000 and delivering 2,000 lumens, will remain in the line. But the new laser-driven VPL-VW995ES, at $35,000, was Sony's big announcement. It replaces the old lamp-driven VPL-VW1100ES and slips between the VW 885ES and the $50,000 VPL-VW5000ES, bringing significant upgrades. Along with the laser engine and 2,200 lumen output, the VW995ES uses the same high quality ARC-F lens found in the VW5000, and adds an important enhancement not previously found in any Sony consumer laser projector: the Advanced Iris dynamic aperture. The combination of adjustable laser light output with the projector's Dynamic Laser Control plus the ability of the auto iris to dial down the light when needed for dark scenes should greatly enhance the projector's deep black retention. Furthermore, the VW995ES exclusively features the new Digital Focus Optimizer, which processes the signal to help retain fine detail away from the center of the lens that's typically lost as you move out toward the edges of a large screen. Meanwhile, Epson, in an effort to show the range of its wares, took the occasion of CEDIA to show integrators an impressive native 4K projector for the large venue market or, alternately, anywhere a large, detailed screen needs to be viewed up close, such as in medical or security applications, or in simulators. The PRO L12000QNL is a 12,000 lumen beast beast with some sophisticated tech on board, including a front-mounted camera that not only allows operators to remotely view what's on the screen, but also to automatically join the images of multiple side-by-side projectors into a single large image with the help of onboard software. Of greater interest to the broad audience was the Pro Cinema 4050 4K Pro UHD. 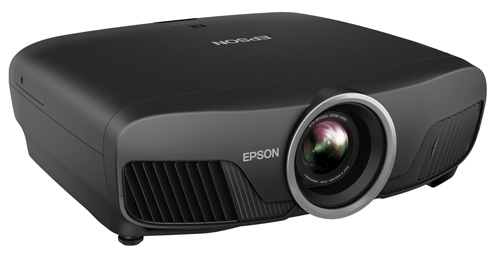 As previously reported, this $2,399 model is a native 1080p pixel-shifter rated for 2,400 lumen light output, and is the first Epson model with the company's new 4K Pro Enhanced pixel-shifting technology. Notably, Epson increased the speed of its pixel-shifting device and with improved processing is able to render crisper detail than with its previous iteration. Epson's show demo bore this out. Projected on a 120-inch diagonal screen, fine details like flyaway hairs on an actor's head or facial stubble suffered no apparent softness I could detect. Another important improvement from prior models is more advanced tone-mapping for HDR content that uses 12-bit processing to reduce banding artifacts, and takes advantage of the extra output afforded by 1080p chips rather native 4K devices, which by nature are more dense and pass less light. Contrast is rated at 200,000:1, considerably less than the pricier Pro Cinema 6040 step-up model that features a dynamic iris. But the 4050's generally striking image, combined with perks like multiple lens memories, powered lens adjustments, and an exceptional range of horizontal and vertical lens shift (none of which are typically found at this price point), should make it an exceptional value. 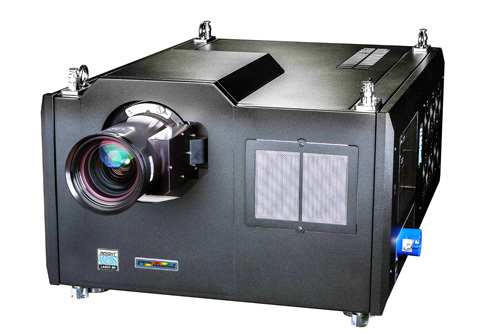 In the "if you have to ask you can't afford it" category, Digital Projection Inc. (DPI) made a big impression with a demo of its large venue native 8K projector, the Insight Laser 8K. It offers 7680x3320 pixel resolution with 25,000 lumen output from its multiple laser light engine, and looked stunning on a 220-inch diagonal Stewart StudioTek 100 1.0 gain screen. It ships in October at a price of $299,000. 'Nuff said. Wolf Cinema, a company that's made it's name selling high-performance hot-rodded versions of already outstanding projectors from the likes of JVC and others, came to CEDIA touting, what is for them, a surprisingly low-cost 4K model. 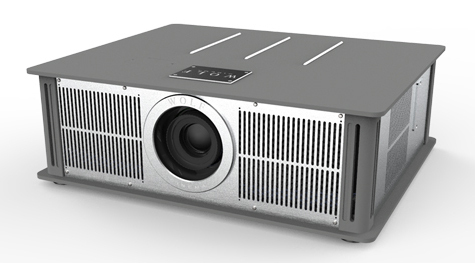 The PRO-817 is a single-chip 4K DLP projector with a laser light engine that costs $9,995, puts out 2,900 lumens, and has a claimed contrast ratio of 2,000,000:1. The company was demo'ing another of their projectors, the TXF-1100, a higher-end sister to the PRO-817 from the Theater Extreme series that offers similar specs and was by far the best looking of any of the new 4K projectors I've seen to date that uses Texas Instrument's pixel-shifting DLP chip (the 0.66-inch in this model). It renewed my faith that in the right hands, TI's cost-effective technology can achieve impressive contrast in a dark-room theater environment. Of course, part of the magic was made by Wolf's optional Pro Scaler processor, which provides a high degree of control for calibration. I expected to see more action in the emerging ultra short throw category, but the announcements here were sparse. 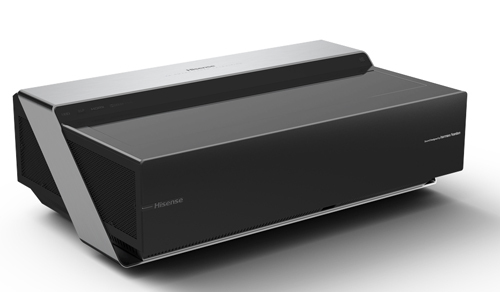 Hisense did add to its Laser TV line, which combines a laser-driven UST projector console with Smart TV capabilities and a compatible UST ambient-light-rejecting screen in a single package. It's previous 100-inch model 100L8E will be replaced by the 100L10E, a new projector with dual red and blue lasers that is said to produce wider color gamut; it will sell for the same $10,000 price and ship with a proprietary screen, which replaces the Screen Innovations ST screen packaged with the original. A 120-inch version, 120L10E, will go for $13,000. And a space- and budget-accommodating 88-inch package, the 88L8E, will sell for $3,800. It comes without the Harman Kardon-branded sound system that accompanies the larger models. 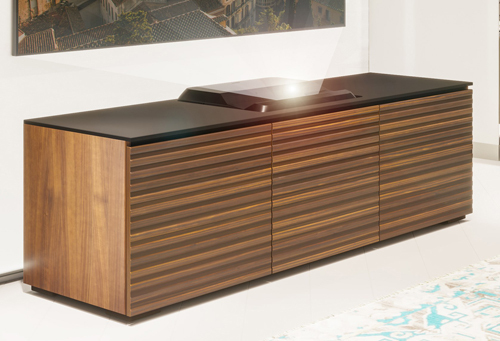 The only other UST news of note was that Salamander, the audio/video furniture maker, has begun offering a more complete line of cabinets with cutouts designed to fit and hide specific UST projector models. The company, after starting out last year with a cabinet customized for Sony's VPL-VW1000ES UST laser projector, is now offering three more to fit the popular products from Hisense, Epson, and Vivitek. Given what I heard at CEDIA, I expect we'll see more, and hopefully improved, UST projectors aimed at the consumer home theater market at upcoming trade shows. Their ease of installation makes them an attractive proposition. Most of the major screen manufacturers were showing either new materials or improvements to their line-ups. Screen Innovations was promoting the fact that its ST short-throw material is now available in a 100-inch diagonal roll-up version using SI's Solo motorized portable screen casing; there were also improvements to its Transformer masking system, and a manufacturing breakthrough with its Black Diamond material, which is now available for the first time in sizes as large as 150-inches diagonal for 16:9 aspect ratio, or 185 inches diagonal in 2.35:1. EPV, the pro division of Elite screen, was showing its own new Darkstar Infinity UST ALR screen, which delivered impressive brightness and contrast in very high ambient light with the image from a Sony VPL-VW1000ES; a 100-inch version goes for about $5,000. The big play at Stewart Filmscreen was a significant update to its flagship Director's Choice motorized screen masking system, which now handles larger screens while showing a significantly narrowed bezel around the screen itself; it can accommodate screens up to 300-inches or 25-feet wide. The 96x192-inch screen demo'd at the booth that was lit up by a 27,000-lumen DPI projector costs $67,000. Stewart also showed its Phantom ALR light-rejecting material. Seymour Screen Excellence, as usual, had one of the best home theater demos at the show. It featured the Wolf TXF-1100 4K DLP laser projector mentioned earlier, Audio Excellence Vertex on-wall speakers in a 7.2.4-channel Atmos configuration driven by a total of 12,000 watts of power, and the company's Enlightor Neo acoustically transparent 4K-ready screen material. The latter looked utterly free of any weave or surface distortion on close-range viewing. SSE also introduced a new screen accessory, a $490 adjustable backlight kit designed specifically to restore accurate color temperature to ALR screen images by counteracting the color temperature of the ambient light and wall color. The LED strips that surround the screen provide white bias light that's tuneable with an IR remote to any color between 3,000K and 20,000K, thus allowing an installer to bring the screen image back to the desired 6,500K white balance required for accurate color reproduction. Clever, eh? We'll end here with something to get you DIYer's excited. Monoprice, the company known for it's high value electronics and accessories, announced a family of Ultra HD 4K-ready screens with a super-smooth 1.1 gain white material that's been certified by the Imaging Science Foundation (ISF). 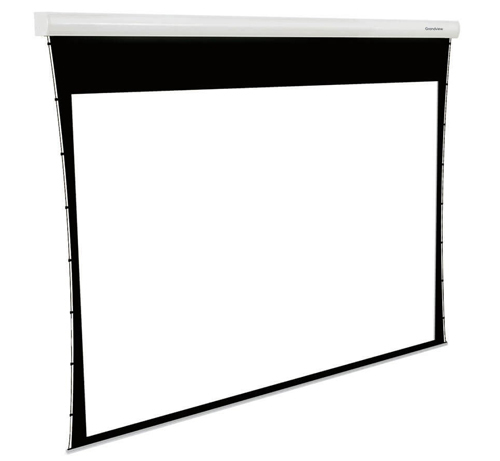 The 16:9 screens come in both fixed and retractable/tensioned motorized versions at 106-, 120-, and 150-inch diagonal sizes. Prices for the fixed models are $600, $700, and $900 respectively. The motorized versions range from $900 for the 106-in a flush-mount case to $1,800 for the 150-inch in a ceiling-recessed configuration. Best of all: free shipping in the U.S., which is often an issue with screens given their weight. The small, 80-inch sample on live display at Monoprice's tiny booth looked surprisingly good given the bright conditions not really suitable for a screen meant for dark-room viewing, but either way you can't argue with the ISF stamp of approval, which insures uniform light and color across the screen surface. If you're going 4K--and I'm guessing you will soon if you haven't already--this may be an affordable option to update your screen for the smoothest possible image. Thanks for a great overview, Rob. Now looking forward to the product reviews! the ISF rated monoprice fixed screens are already marked down. the fixed 120" is $478 on amazon instead of $700. Chris is right--Amazon, for now at least, appears to be selling the 120-inch and 106-inch fixed frame versions at a significant discount off Monoprice's own web prices. I just wish their were more self-supporting screen options. It sounds like the screen selection can be as important as the projector selection, but living in an apartment I'm basically stuck with a very narrow range of screens with a built in tripod. Or even better, a tripod meant to work with screens intended to be ceiling mounted.